Welcome to my first ever blog post (check out my About Me here). How exciting! 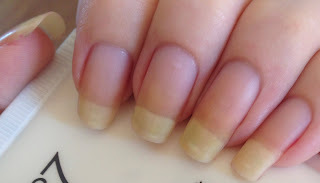 I have been leaning towards creating a nail blog for several months. After posting a nail care essentials photo on my Instagram. I began imagining what I would add if I had a blog, and the ideas came flooding in. So, a few days later, here I am! Let's get started, it's going to be a long one! Find out more after the jump! I actually never used to like them - I didn't appreciate the slimy, greasy feel of those I'd tried. But now I can't leave my flat without one! I'm always trying new brands and scents. I aim to moisturise my hands at least once per day, but normally do it twice. Since around Christmas I have been using the same two creams. Whenever I go out, my Boots No7 'Protect & Perfect' Day Hand Cream (online here) comes with me. I use this nearly every day at work (Mon-Fri), and somehow the 75ml bottle I've had since Christmas isn't quite empty yet. I find this super moisturising and non-greasy, and it smells lovely. I also tend to use this on any irritated skin - it soothes any itches or dry patches of skin surprisingly quickly. At home, I've been using Soap & Glory's 'Hand Dream' (online here). I find this a bit thicker than No7's cream, but it sinks in just as quickly. My favourite thing about this cream has to be the smell. Soap & Glory products all smell amazing, and this is no exception. My current bottle is starting to run out, but I have several back ups at the ready. I'm not fussy with cuticle oils, and tend to have a few variations lying around. I normally moisturise my cuticles once a day before using a hand cream - although I have to admit sometimes I'm lazy and skip this step! I have several unbranded cuticle oil pens. These may not be the best, but are cheap and easy to use. They come in a variety of scents so you're bound to find one you like. I tend to reach for these when in a rush or if I'm feeling too lazy to use a proper cuticle butter. I have an old Ciate London cuticle "Love Me Oil". This smells absolutely divine - a raspberry/cranberry scent. I haven't managed to find it anywhere since, so rarely use my bottle. I'm scared to use it up! My current favourite and most effective cuticle moisturiser is the 'Lemon Butter Cuticle Cream' from Burt's Bees (online here). Again, I absolutely love the strong lemony smell (can you tell i love scents yet?!). A little bit of this goes a LONG way. My small tin only looks lightly used after several months. I recommend a glass or crystal file - they are more effective and do not pull at existing snags or tears. I normally only use a file when I catch or break a nail. I recently found some in plastic holders in Poundland, perfect for chucking in your handbag. 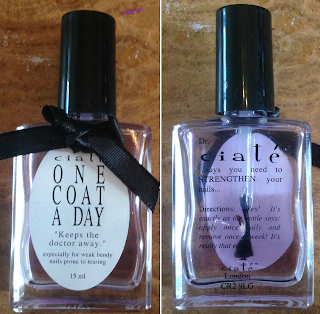 My holy grail base coat is Ciate London's 'One Coat A Day' nail strengthener. Again, I haven't been able to find this anywhere. Luckily, I have 5 back up bottles. Yes, five! Since I started using this as a base coat, I rarely break nails, my polish lasts longer, and my yellow staining is growing out - it now starts about two-thirds down my nail as visible in the picture below. Technically, topcoats aren't nail care. 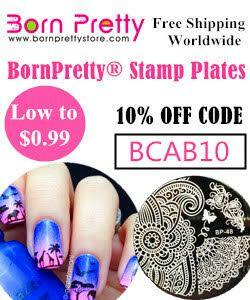 But they are essential for a glossy, long-lasting manicure. Below is a small selection of the many topcoats I own. Initially, I only ever used Barry M's topcoat, so much so that I have used several bottles. Slowly, I accumulated topcoats from other brands. When I could, I matched the topcoat to the brand of polish I was wearing. A couple of months ago, I finally purchased Seche Vite fast dry topcoat. I was converted instantly, and now use it every time I do my nails. I absolutely love that it dries so shiny and so quickly - no more worrying about smudges and sheet marks! There we have it, my nail care essentials! I haven't included any cuticle eliminators, dissolvers or cutters as I never use them. 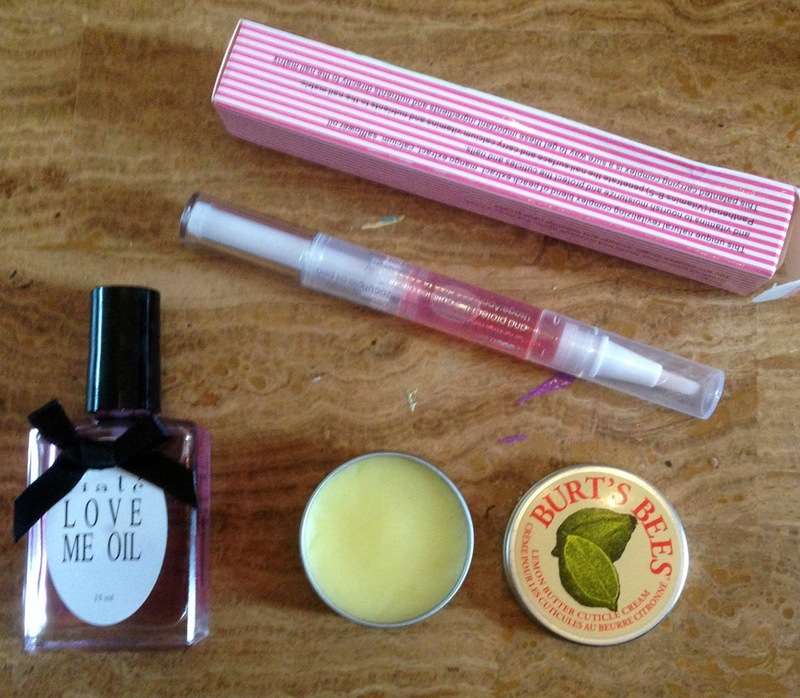 I stick to hand and cuticle creams and oils to ensure I always have healthy cuticles. Thank you for reading to the end of my very first blog post! What do you think of my essentials? What are yours? Leave me a comment below and let me know.